To obtain a planning-related volunteer position in the Winter term of the 2012/2013 school year. I am looking to add to my professional skills and diversify my experience within the planning process. 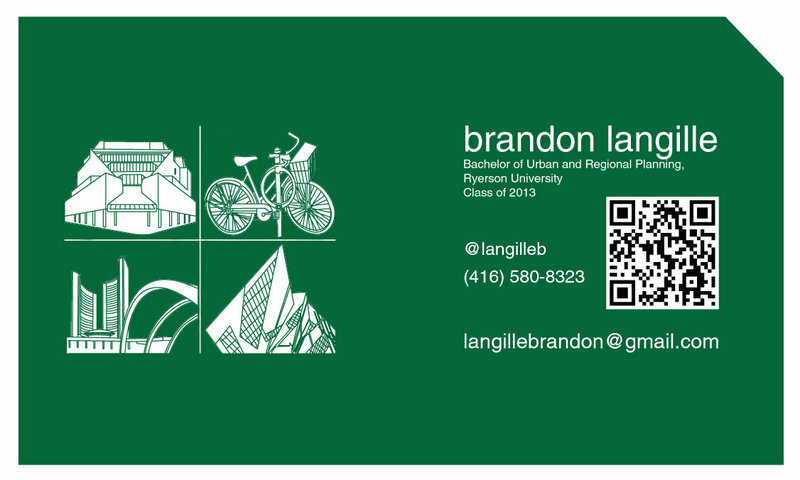 I am currently in my fourth year in the Urban and Regional Planning Program at Ryerson University. My interests in planning include a wide range of public policy and planning related issues: municipal policy process, civic engagement, active transportation design, zoning and land-use designation. Ability to complete report research, writing, and design. I was elected the Vice President of Student Affairs as part of the current 2012-2013 RAPS team. 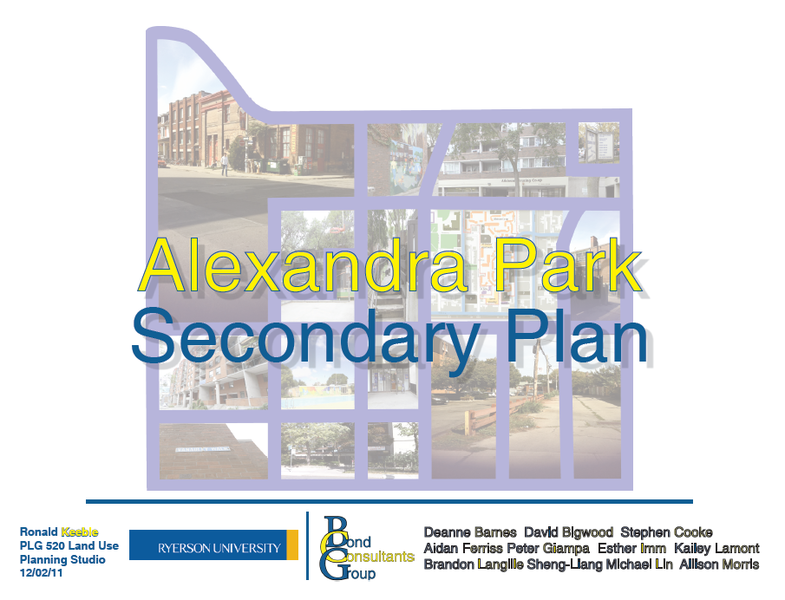 Our mandate is to make the student experience for the School of Urban and Regional Planning a more positive, efficient and successful experience. Some of the projects we have planned for the next semester at Ryerson include guest lecture series, urban planning related game/movie nights, off-campus socials, and the annual School of Urban and Regional Planning Expo. The expo is designed to bring students from other planning school and programs in Ontario to participate in workshops, experience lectures from leaders in the profession, and to act as a networking event. The title of this group studio project was 'Lower Don Greenway: Ecological Infrastructure for the Evergreen Brick Works and Lower Don Trail'This studio project involved undertaking an extensive inventory of existing conditions along the Lower Don Trail and its surrounding area. Our task was to create a visually compelling and engaging narrative centred around the Lower Don Valley. Our research included documentation of the area’s cultural and ecological assets, as well as an exploration of its evolution over time to help the audience understand the future potential of this vast resource. This project is part of an ongoing relationship between Ryerson University and Evergreen Brick Works within the framework of an “Open Studio” under the guidance of Professor Nina-Marie Lister. This work helped build a foundation for future studio groups and to continue a conversation between the City of Toronto (through the TRCA), Evergreen, and the users and visitors of the valley. Our project consisted of two main components, the first being a series of panels which were displayed at Evergreen Brick Works on November 19th. These informative panels were accompanied by a set of public participation boards. 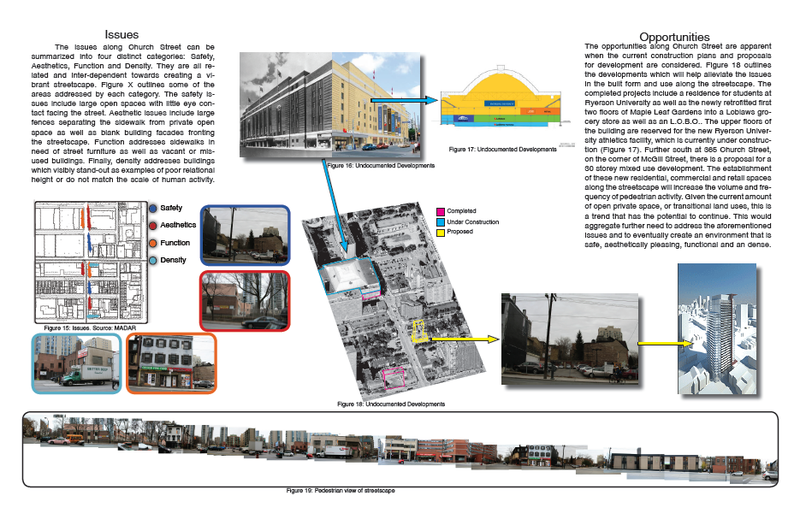 The second component of the project used the results of the public's engagement with the exhibit and built on the narrative of the valley with a comprehensive visual timeline and a collection of case studies that can be applied to the inspiration for the master planning process. As a requirement of the studio course, both sections of the project were presented to our peers and a panel of experts and professionals within related fields. Since that time, Evergreen has asked that the project be re-printed, so that it may be installed within the Brick Work's welcome centre at the beginning of February. I have recently begun volunteering for my local ward cycling advocacy group. Since moving to Toronto in 2009 I have been using my bicycle as my primary mode of transportation. This has opened my eyes to the inadequacies our city experiences in terms of cycling infrastructure and safety. It has also spurred my interest in focusing my education at Ryerson to studying cycling as a means of creating change within cities. The cycling issues in Ward 18 are similar to those experienced by other neighbourhoods and wards within close proximity to downtown. My focus for cycling advocacy in Ward 18 is to work closely with my fellow volunteers, grow our membership base, and use my planning expertise and design skills to help create reports, flyers, and online discussion through twitter and facebook. I had the pleasure of working with the Toronto Association of Business Improvement Areas on an analysis of Toronto's use of the BIA model.This work was done in association with Ryerson University through the 3rd year Client Studio. I was part of a large group working towards a final report due in March, 2012. Melbourne is a beautiful city with many parallels to Toronto and other Canadian cities. I thoroughly enjoyed my time there and appreciated learning in an international context.